YOGYAKARTA- Three MD FEB UGM students received the second place as a team in MM UGM Business Case Competition 2018 at 12th May 2018. The three students are Raden Roro Hasthi Nuroktriana Mispawanti, William Wendy Ari, and Nia Ariyani Erlin. The three students are 3rd-semester students in Master of Science in management MD FEB UGM. In the interview with the team, they stated that they joined the competition to gain experience in solving a business case. Joining the competition is the way to improve ourselves, winning is only a bonus from our effort” Raden Roro or also known as Rara. The competition, MM UGM Business Case Competition 2018 is a competition held by MM FEB UGM (Master of Business Administration FEB UGM) as one of the events celebrating 30th years anniversary of MM FEB UGM. The competition challenges the participant to solve given a real business case in written form in the first round. The paper then remarked by the panel judges and teams who pass the first round should present their solution to the given case orally. After the presentation is delivered, the judges announced the top three team. The announcement and inauguration of the top three teams were held on 12th May 2018. 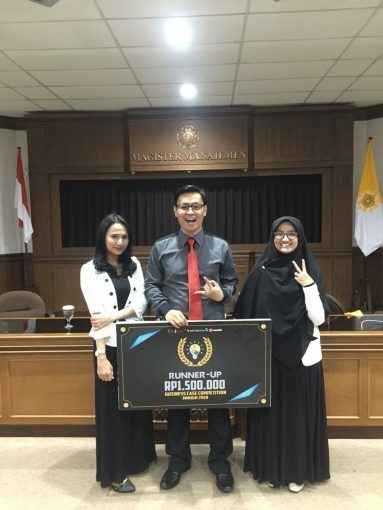 After got the second place, the three students look forward to gaining more experiences in more business competition and advice their peers in MD FEB UGM to do so. “Benefits of joining such competition is not only in the winning prize, the competition will help us to gain more knowledge and become a venue to self-develop yourself” Stated by Nia.